Our Bajan Princess, singer Rihanna is to put her name to four collections with MAC Cosmetics, calling the collaboration a "no brainer". It is called the RiRi (Hearts) MAC. 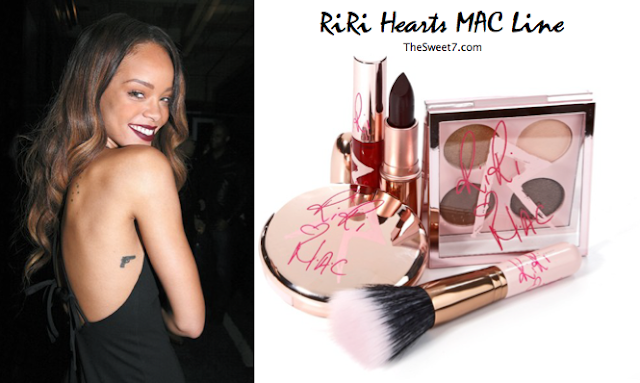 RiRi [Hearts] MAC, will break throughout 2013. Her make-up debut includes a red lipstick named RiRi Woo, based on her favorite existing lipstick from MAC Ruby Woo. Its release will coincide with Rihanna’s Diamonds Tour concerts on May 4 and 5. MAC will open a pop-up shop on the first night to showcase the line. Her name will appear on the packaging, and her signature will be embossed on the RiRi Woo lipstick case and on the bullets of the summer lipsticks, as well as several of the fall and holiday pieces. RiRi Woo will be sold at the Rihanna concerts and online, and a summer collection will follow, which will also be sold online. A third will land in brick-and-mortar stores for fall, and there will be an on-counter holiday collection. The signature piece of the lineup, RiRi Woo, will be sold with all four collections. The summer collection also includes two additional lipsticks, a Lustre Drops shade and a powder blush duo. Fall’s 16 sku’s include four lipsticks, a deeply pigmented Lipglass version of RiRi Woo, two multishade eye shadow palettes and false lashes. “She likes to wear two pairs at a time,” said Jennifer Balbier, MAC’s senior vice president of global product development, in an aside.) Holiday will bring another 10 items, including nail polish, a makeup bag and additional lipsticks. This may get me to a MAC store this year!